Subtle sexism is hard to point out, especially when it comes in the form of a compliment. A series of illustrations called "Backhanded Compliments," drawn by 19-year-old artist Vanessa Papastavros, show how often women receive compliments that are actually insults. "The insult is subtle, it's encased in some flattery, but at the end of the day it's still singing the same broken-record tune: as a woman, you are not meeting my standards," the Australian-native told The Huffington Post. The series features drawings of women, each paired with a backhanded compliment she's heard in the past and the way she wishes she had responded. The women included are of all shapes, sizes and colors. Backhanded compliments are a special kind of insult, Papastavros said. "They are often exchanged in a more personal format, and directly tailored around your insecurities. They are often said by people you know well," she continued. "And, most unfortunately, they are a passive-aggressive form of body shaming that tends to leave you feeling offended but powerless to protest." The backhanded compliments highlighted in the series primarily revolve around women's looks, such as "You look so much prettier with your hair straight," and "You would look so pretty without your glasses." The series was initially based on backhanded compliments Papastavros and her friends had received. After the drawings gained some traction on her Tumblr page, Papastavros invited followers to share the backhanded compliments and "sugarcoated insults" they had heard, and she illustrated some of them. Most of the submissions came from women. "Backhanded compliments are disproportionally aimed at women, and that's hardly a surprise," Papastavros. "The body-shaming culture perpetuated by both men and women links back to the belief that a woman's worth or value is found in her appearance or desirability. Often, people are trying to put down or subtly control a woman's decisions about her appearance through a backhanded compliment. They want to make you into what they​ consider acceptable and attractive." "Unlearning this way of thinking starts with educating oneself about body positivity, feminism and basic human decency," Papastavros continued. "It's all about broadening your view of beauty and where it can be found, and embracing that with confidence." 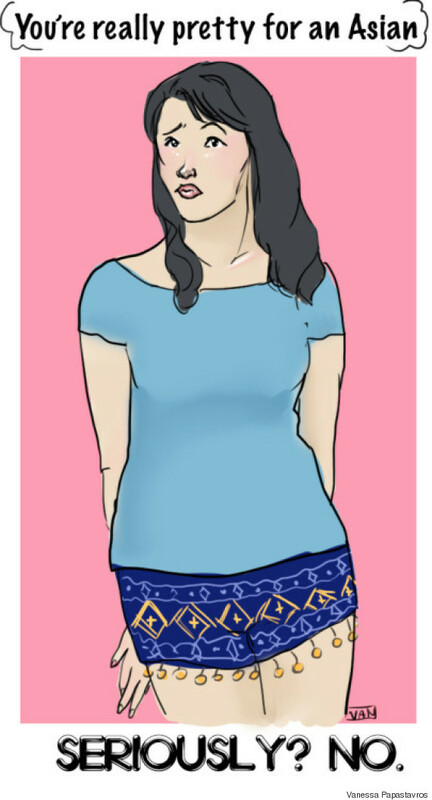 Head over to Papastavro' Tumblr page, Van's Scribbles, to look at her other body positive artwork.